Hi, and thank you for your interest in our restaurant, seasons eats, (formerly Katie's Gourmet). 1) Our menu will reflect the dining desires of our customers as the seasons change. 2) We use the freshest foods and ingredients available throughout the seasons. 3) Phil, the chef, is a master at seasonings in his sauces, soups, dressings and suppers. 4) We've been around for 84 seasons and counting. Seasons eats offers hot breakfasts starting at 7:30AM Monday – Saturday with egg sandwiches, breakfast burritos, pancakes, omelets and more, such as great fresh brewed coffees. Lunch is served from 11:00AM including: homemade soups, chilies, unique, healthy and interesting sandwich combinations and the freshest salads. Supper entrees are served until 6:00 to take home after a hard day’s work. In addition to our extensive menu and catering options, the chef offers Daily Specials which you can check out right now, or sign up to receive our daily morning e-mails. 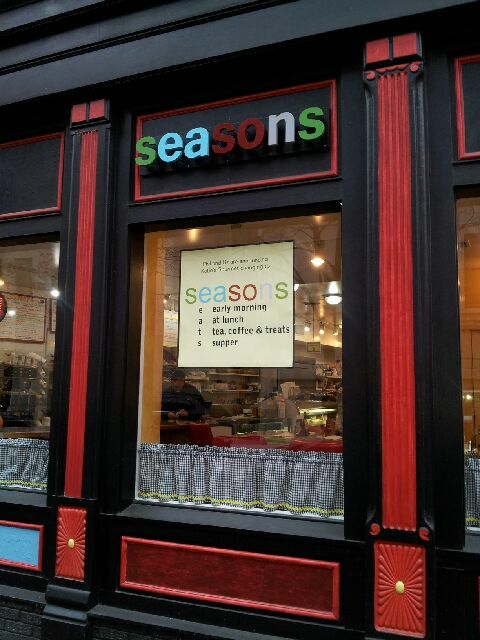 Seasons has seating inside or outside (seasonal), and is open Monday–Saturday. You can swing by and pick up or we will bring it to your car and delivery too. Seasons is located in downtown Stamford, off exit 8 (north bound) or exit 7 (south bound) on I-95. 29 Bank Street is located between Atlantic Street and the bottom of Summer Street. The outside colors of our deli are black, bright red, and we overlook the Old Town Hall Park. We look forward to seeing you or give us a call to help with your questions and dining needs. Enjoy the rest of the website! Call for new hours.